When it comes to food, Chris and I are generally on the same page. But one thing that I really like that he's not a big fan of is shrimp. So on a recent weeknight when I had the home to myself, I decided to make this wonderful recipe I found in Bon Appétit for shrimp and grits. This Southern classic is traditionally served a breakfast, although it's not uncommon to see it on dinner menus (DC's Vidalia has a shrimp and grits dish with mustard greens and ham that sounds amazing). A particularly adventurous aspect of this dinner was that I peeled and de-veined the shrimp myself--an experience worth doing if you're curious about what it entails and can't find the already peeled and de-veined kind. 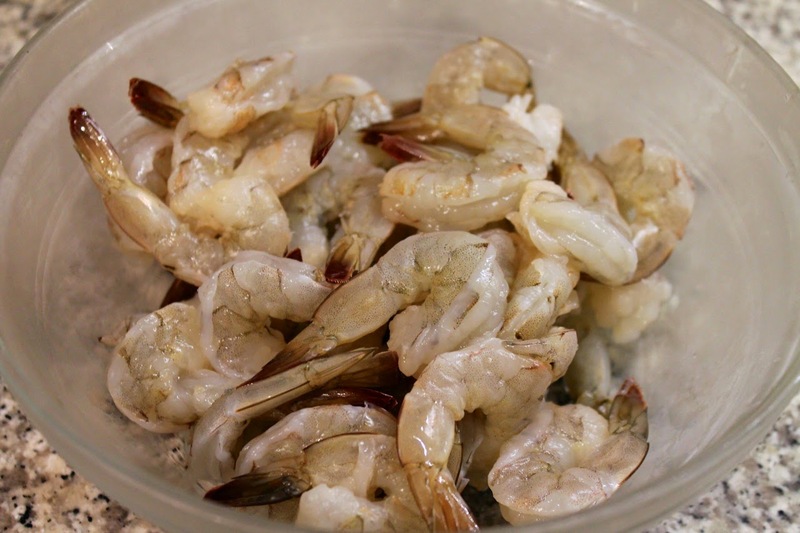 Although Whole Foods often has already peeled and deveined shrimp, when I made this dish, they only had the kind that still has the shell and legs attached. The shell, which protects the shrimp's abdomen, is called the carapace. Using your fingers on the underneath side, it's pretty easy to separate the legs and shell from the body. You can pull the legs off first, but it's not necessary. The shell will come off in one piece, generally consisting of about three segments. Leave the final segment before the tail intact (the segment without any legs attached). The deveining part is a bit more complicated, and also deceptive. See, there are two parts of the shrimp that could conceivably be the "vein," although in truth, neither is. 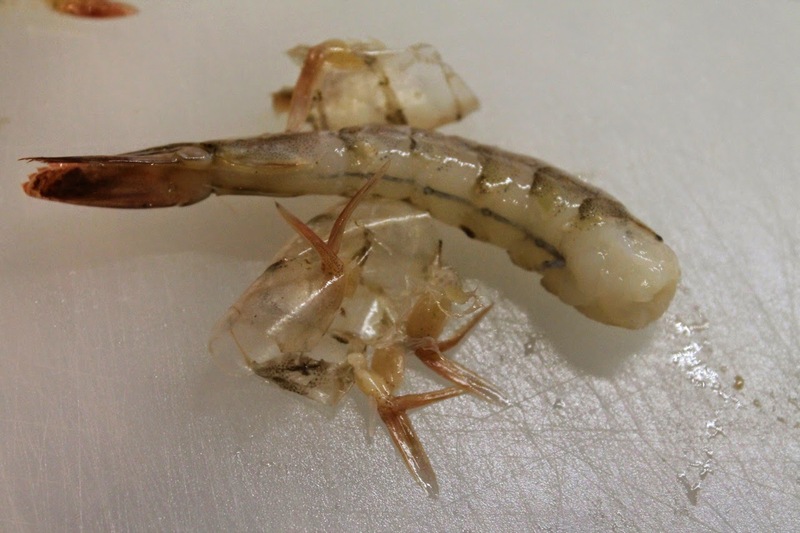 On the bottom side (the side where the legs were attached), there is a visible "vein" that is the shrimp's central nerve. You can remove this if you want, but most people just leave it there, especially for small to medium-size shrimp. 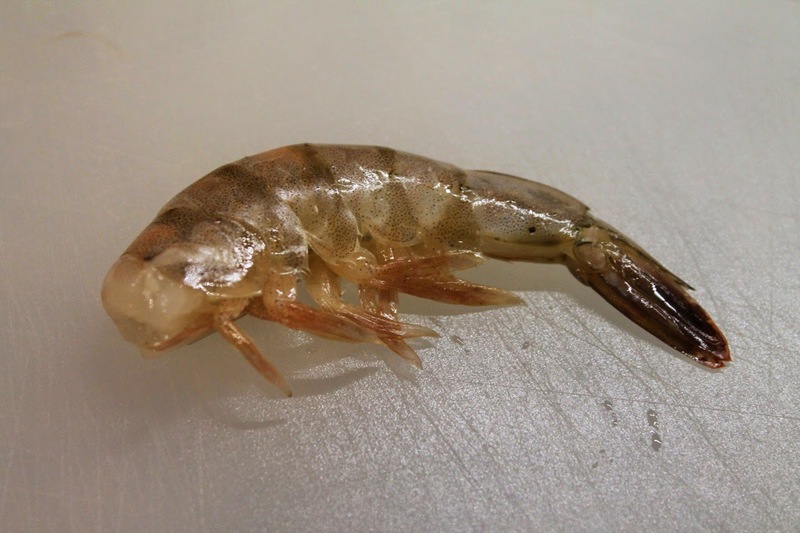 The "vein" people talk about removing is on the back of the shrimp (the side under the shell). This is actually the shrimp's intestinal tract, sometimes referred to as the "sand vein." To remove it, use a paring knife to make a slit about 1/8-inch deep on the back of the shrimp from the head end to the tail. The vein may be dark gray but sometimes (I suppose if the shrimp hasn't eaten recently), it's just white. Use the tip of the knife to pry the vein out and discard it. The shrimp is now ready to cook. Since I'd never done this before, it took me awhile to get through the shrimp--about a half an hour--and my fingers smelled a bit "shrimpy" afterwards, even after multiple washings. For a few more dollars, if available, I'd probably buy the already prepped kind. But if you like this kind of prep work, it's really not that bad. 1. Using the large holes of a box grater, grate the kernels off of 2 ears of corn into a medium bowl, catching as much corn juice as possible. Run a knife over the cobs to extract any remaining juice and let it drip into the bowl. Using a knife (or specialized tool), remove the whole kernels from the third ear of corn. Discard the cobs. 2. Combine broth, milk and water in a large (4 qt.) saucepan and bring to a boil. Reduce heat so that liquid is at a simmer (a touch below medium) and whisk in the grits. Simmer, whisking frequently, until the grits are very tender, about 20-25 minutes. Stir in the butter and grated corn with corn juice. Season with salt and pepper. Set aside for about 15 minutes. 3. Heat olive oil in a large sauté pan or frying pan over medium heat. Add the garlic, oregano and paprika and cook, stirring frequently, until fragrant, about 30 seconds to 1 minute. Add the whole orb kernels and cook, stirring occasionally, until golden brown, about 5 minutes. 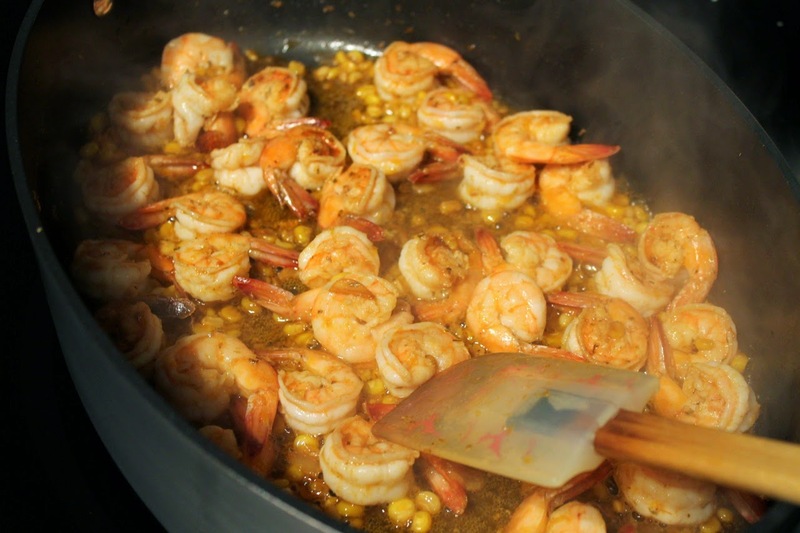 Add shrimp and cook, tossing occasionally, until cooked through, about 5-6 minutes. 4. Spoon the corn grits into a shallow bowl and serve topped with the cooked shrimp and corn mixture. Garnish with fresh chives. Looks delicious! Shaw Tavern in my neighborhood also offers are really nice Shirmp and Grits (for those days you don't feel like cooking). I really want to try Shaw's Tavern. Heard it's really good! 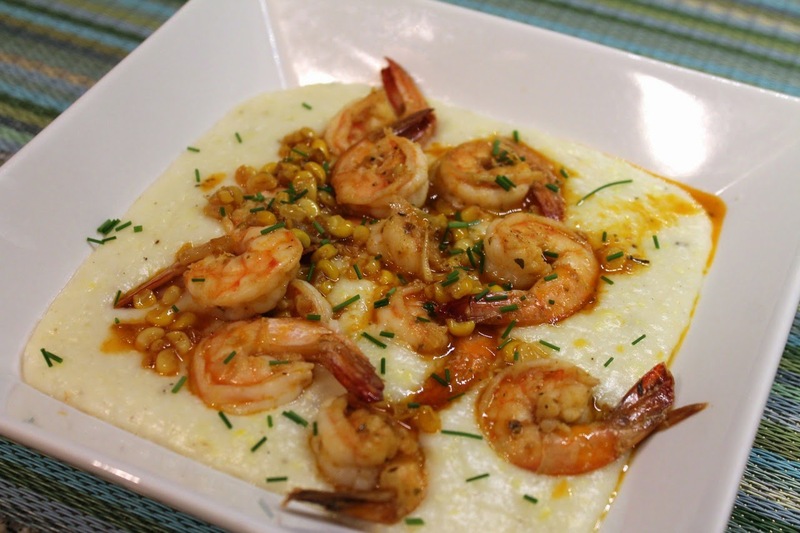 Yum, I loved Shrimp and Grits Growing up. I have yet to make them on my own though. Mathcbox has delicious shrimp and grits but they serve them with too much butter. These look delicious! Thanks! I'd never made them before this and really enjoyed the fresh corn in the mix.